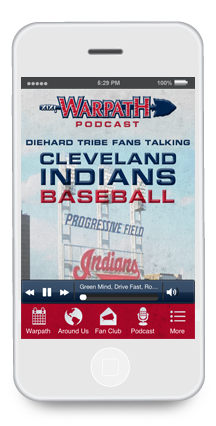 Warpath is a fan-focused roundtable discussion hosted by 3 diehard Cleveland Indians fans from Northeast Ohio. The combination of these personalities, and the unique perspective they bring to the game is well worth the free download! 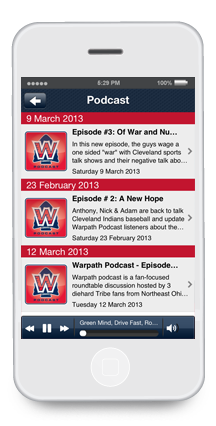 The Warpath Podcast App will focus exclusively on Cleveland Indians Baseball discussion. This show is ONLY for the most diehard of Tribe fans. If you can’t get enough baseball talk, come join us. "We are incredibly excited to unleash the WarpathCLE app onto the world! Cleveland Indians fans everywhere can rejoice now that their one-stop shop for tribe baseball banter is available for download on their mobile device absolutely FREE of charge. The app includes: easy access to the 2013 Cleveland Indians Schedule, all of the audio for each of our Tribe fan roundtable podcasts, an interactive map which showcases entertainment spots within your GPS area, and best of all a place fans of the show can record questions or comments to be played on the air. This amazing piece of interactive software wouldn't be existent if it weren't for the tireless efforts of 529 Mobile Solutions. Their dedication, efficiency, and knowledge were incredible throughout the whole project. They walked us through the process with the heart of a teacher, making sure we understood what was happening each step of the way. We can't thank the team at 529 Mobile enough for delivering us the highest quality product on the planet. As you can tell, our expectations certainly were exceeded. Now, there's only one thing left to say...Go Tribe!"